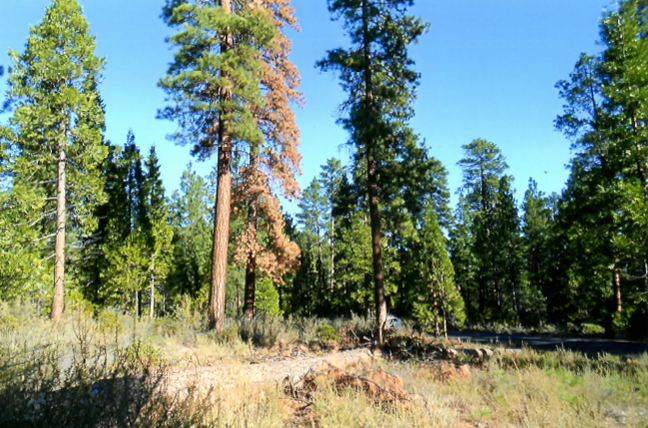 Do you or some of your friends own some western pine forest land? Are you facing beetle hits and dying trees on your property? Is the filth from government forest land rolling down on your land? If you follow the advice of your duly authorized forestry officers or the local pest control industry in your area, your options are not too good. In the fullness of time, all your trees will die, probably burn up in a large fire and you will not live long enough to see a new forest take their place. If you hire a duly licensed chemical pesticide applicator, you will have to pay over $10. every year to protect EACH TREE on your property. This will take a lot of Permethrin or Sevin or a lot of Verbenone patches, poisons that will spill over into the rest of your environment. Or, you can call me. But, I have to warn you: I am not independently wealthy. Adrian’s Tree Service is not a non-profit institution. I am not benefitting from a government grant. It’s going to cost you some money to get me to come out to your place. It is going to be cash-and-carry. It is impossible to get my gear through airport security and fly out. I will have to drive the distance. This will amount to a week of on-the-road expenses before doing the first tree. Two thousand dollars and a week’s free room and board at Mystery Mountain were not sufficient to cover a trip to the Black Hills. When working tree pests under my license here in Louisiana, I normally charge between $500 – 2000 for a single day’s work, including materials. But, happily, it is not necessary for me to spray ALL of your trees to save them – only the “green hits”. And, if you cruised your property yourself, marked the green hits and tallied them – you’d save me a lot of time and expense doing so. 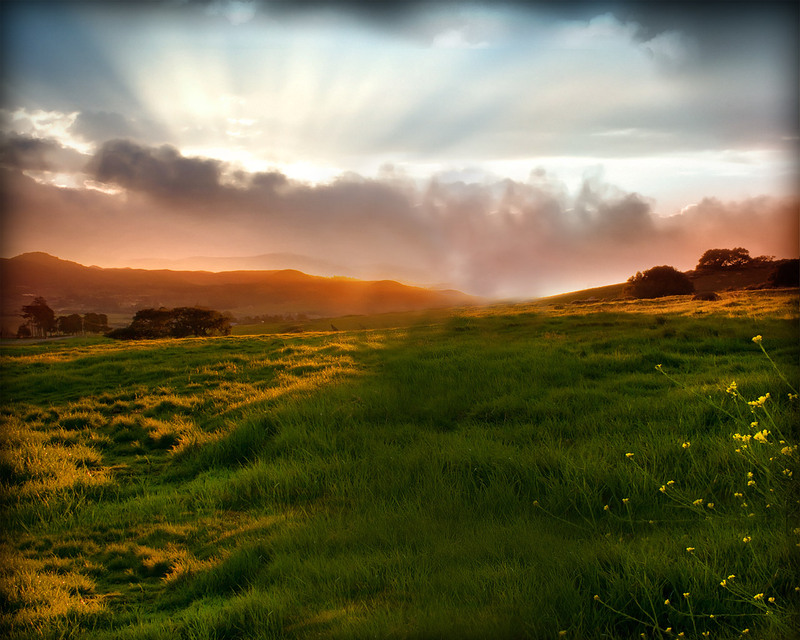 The bigger the population of green hits, the lower the cost per tree will be. Or, you can take delivery of a package of fungus culture plates and Steinernema worms from me for about $200, plus postage. You will need to be ready to apply the material almost immediately upon receipt because of its short shelf life. A package can do about 50 green hits. If you have your green hits previously marked and tallied, application time will be minimized and the job will go smoother. You will need to get hold of a sprayer that is capable of getting 30 feet up the trunks of trees and be portable through your woods. The best sprayer for the job is a Stihl (R) mist blower. Mixing in 2% safety oil + 2% molasses helps keep the pathogens from being degraded by wind and UV light. We found longer-term protection of pine trees occurred when we sprayed understory plants that were infested with scale insets, box elder bugs of aphids. These insects are food for “our fungus”, increase the inoculum in your environment and keep it around longer to protect your pine trees. Even if the beetles kill your pines, they will fail to emerge because the grubs will have been killed. With standard spray programs, these “hits” would have been lost anyway. But, you will not have to remove these trees quickly to disinfest the rest of your forest. Bark beetles start hitting new trees in July and the flights run all the way until October in most regions of the west. The most effective time to be spraying green hits with biologicals are the months of August through October. So, if you have questions or just want to talk, I will listen. I’m at adriantree@aol.com or my cell phone number is 504-259-2031. For more information, download “Stopping pine bark beetles with ‘Pork’n’Beans'” (PDF, 3pp, 860KB). Ponderosa pine in Laurel, Montana, August 2010. This tree was “hit” by bark beetles in July 2009, marked and sprayed in September 2009 and is alive and healthy, even though covered with pitch tubes. View of Black Hills N.F. area #2 above Hill City, S.D., September 2009. Sprayed green “hits” were marked with a red letter “A”. Close-up of Ponderosa pine bark showing a group of fresh pitch tubes: beetle “hits”. View of Black Hills N.F. area #2 above Hill City, S.D., September 2009. Brown, dead trees were hit by beetles in 2008 and earlier in a multi-year expanding die-out. Green trees in the center were hit in July 2009. I sprayed the trunks with our mixture in 9/2009 and most of the green hits died. But by August 2010,…but: the forward progress of the beetle into surrounding green timber was halted. August 2010: Grove of trees near the Mystery House at Mystery Mountain Resort, August 2010. Numbered trees were hit by beetles in July 2010, numbered and sprayed in September 2010. Only tree #49 (center, closest to house) was dead, full of adult beetles and had to be removed in a sanitation cut. Adrian demonstrates beetle-inspection techniques for Ponderosa pine. Tree #61 at Mystery Mountain Resort, Rapid City, S.D. Note the clear, white cambium with only a vertical, brown nuptial chamber in the center. The baby beetles were killed in October 2009 and the tree was saved. August 2010: Darrell with large Ponderosa pine tree at the home of an old golf pro, located just below the Billings, Montana airport. The tree was sprayed in October 2010, is still full of pitch tubes, but still lives. Adrienne at Mt. Rushmore, South Dakota, August 2010. Note the path of dying pine trees under George Washington. Bureaucrat technician for the City of Billings: 100 pines sprayed by us in October 2010 were removed the following spring. The trees were still green, with no evidence of beetles inside. This was an act of sabotage. Adrian spraying beetle-infested Ponderosa pine trees north of Ft. Collins, Colorado, September 2009. Within one year, the entire group of 300 trees were cut down and removed, even though they were still green and healthy, with no signs of beetles under the bark. Beetle killed Ponderosa pine tree on the Deschutes National Forest in the Central Oregon cascades. 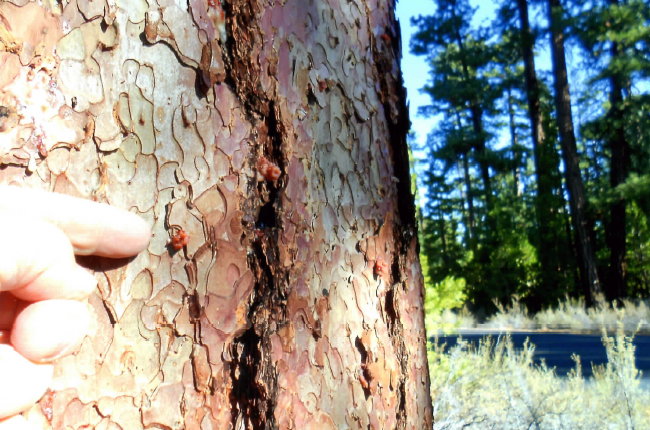 Emerging beetles spreading by the thousands from trees like this threaten the finest stands of Ponderosa pine in the United States. November 2014. Pitch tubes from beetle attacks on a mature Ponderosa pine on the Deschutes National Forest, near Bend, Oregon. November 2014.